The oneness of Christ’s Body is something we are rarely encouraged to consider. From a safe distance we smile suspiciously at those believers who don’t practice Christianity the same way we do, or who embrace a different view on non-foundational interpretations of scripture. Somewhere in our journey we became convinced that our little crowd, our denomination, our leaders, our practices, are what the Body of Christ is all about and those who do things differently are little more than uninformed fringe dwellers in His Body. Sure, we will all meet up one day in Heaven but for now our part of His Body is where the action is and it’s what our crowd are doing that is central to God’s purposes. When there is serious friction in our local assembly, we fret over there being a ‘split’, a ‘division’ in the Body. Consequently our perception of Christ’s Body remains limited and immature. As one of the visitors to this blog wisely commented, we act as though the Body of Christ is something that exists separately to Him….something He perhaps looks in on from time to time but mostly allows to get on with the business He has assigned to it. The truth is quite different. When Christ looks at His Body He sees it as Himself, just as you and I consider our hands, our feet, our nose, ears and our internal organs as ourselves. We do not differentiate between our heads and the rest of our physical body, so why do we think that He would do so with His spiritual Body? Furthermore, He sees His Body not as a myriad of little independent parts doing their own thing disconnected and apart from one another, but as one single entity. We, being many are one bread…..for we are all partakers of that one bread. It’s common practice these days to hand around individual pieces of bread or something similar to members of Christ’s Body during the communion ceremony. That is not how it was meant to be. 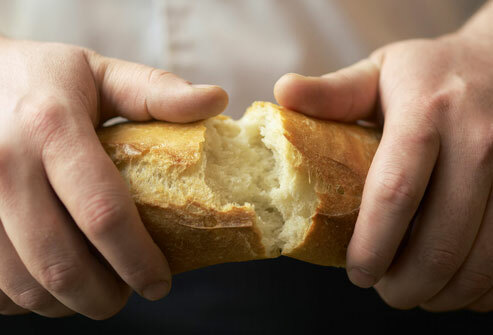 The bread that Jesus shared during that first communion was one single piece which He broke once and then passed among His disciples so they could also partake of that one piece. In the same way, they did not drink the wine representing His Blood from individual little cups. They all drank, in turn, after Him from the one single cup. We have lost the depth of the spiritual significance of communion, which is primarily about our need, firstly for Christ and secondly for one another. Jesus was not speaking merely to twelve individuals that night He broke the bread; He was speaking to His corporate, many membered Bride. When partaking of the communion symbols becomes an individual religious exercise instead of a celebration of our corporate identity in Christ, we fail to discern our need for one another and therefore fail to discern the Lord’s Body (1 Cor. 11:29). The scripture states, however, that we, His Body, gathered together spiritually, are now that one piece of bread! That bread of which we all partake together also represents Christ Himself, the Bread of Life. And Christ is not divided (1 Cor. 1:13). “My church split” people say. No it didn’t. The church is the Body of Christ and cannot split. What happened was something occurred in your local assembly where the flesh of man tried to replace the pre-eminence of Christ (1 Cor. 3:3). And it may be exceedingly painful to witness and be affected by the turmoil that can result, but your church didn’t split, fall apart, fracture or divide. Your church is not the place you go to express worship; your church, Christ’s Body, is what it has always been, a spiritual gathering unconfined by time, space or geography (John 4:21-24). If you are in Christ then you remain part of that spiritual Body whatever else may be happening around you. If we continue to insist on identifying exclusively with one particular group of believers that emphasises certain doctrines, meets in one place, and regards other groups of believers as not part of them let’s not confuse it with the Body of Christ. Let’s call it what it is, which is denominationalism. Denominationalism can experience splits and fractures. The Body of Christ cannot. It is the specific role of the Holy Spirit to unite believers into one Body and He does this at the moment of our coming into Christ, or being born again of the Spirit. The believer’s role is simply to endeavour “to maintain the unity of the Spirit through the bond of peace” (Eph. 4:3). Unity is not uniformity, nor is it ecumenism. Unity allows for differences of expression and practice if those expressions and practices are not life threatening to the Body, and by that I mean they do not depart from core foundational doctrine. In fact, God’s love for diversity is evidenced by looking at the created world around us. Unity in the Body, however, can only be maintained by those who are at peace with one another within their diversity. Wherever believers are truly holding fast to their Head peaceful diversity can flow from Christ the Head throughout His Body (Col. 2:18,19) But wherever the Head is not given His rightful place disunity will manifest. Too often when believers speak of Christ being the Head of the Body they are speaking in terms of hierarchy because this is what they think Body life is about. So we speak of His headship ‘over’ the church because we are concerned with authority and chain of command. When the New Testament speaks of Christ as head of His Body, however, the Greek word “kephale”** is used, which more accurately means “source” or “origin”. The idea behind the word is not our modern Western understanding of ‘head’ as someone being in charge. Rather it implies the life spring, the fountainhead, the origin, beginning and source of all life. Every part of the human body is connected in some way directly to the brain, which is the physical and emotional life-source, the origin of the body’s activity and functioning life. Similarly, every member of Christ’s body partakes of all that is promised in Christ. Christ is His Body’s endless life. Christ’s Headship of His Body therefore is more about provision than authority. The Body can do absolutely nothing without the Life that flows from the Head. Without that continuous free flow of the Life-source that is Christ, everything and anything the Body touches or attempts to establish will end up as the works of a dead religion. Am I saying Christ does not have authority over His Body? No. But authority and submission only become issues when grace is being prevented from functioning through sacrificial love. The three members of the Godhead, Father, Son and Holy Spirit, are equal in function and authority, yet ‘who’s in charge’ is not an issue in their relationships because of the divine sacrificial Love that flows freely and constantly between them. This Love between the three equal members of the Godhead is “oneness”. It is the very same oneness that Christ prayed His Body on earth would know (John 17:11). His Body is one single entity, receiving and expressing the divine provision of His own endless Life through oneness with Him. So we have discerned that the Body of Christ is a spiritual entity, and that the Body of Christ is one within Christ. Stay tuned for more in this series as we discover together what it means to be the Body of Christ. Thanks for your comment Mr. Teague. Would you car to elaborate briefly on Judges 19 and 20? Of course! Now you’ve got my attention. Yep, it’s obvious once we see it. Really wonderful post, thanks so much, Cheryl. Thankyou for the reblog Karen. Thank you for such wonderful soul-food for this morning.